COQUITLAM, B.C. -- The NDP is promising to bring in a universal and comprehensive national pharmacare program targeted to begin in 2020 if the party wins the next federal election. "This is a bold plan, it's going to take some courage. It's going to take us standing up to pharmaceutical industries and insurance companies who don't want us to bring this plan in, but we know this plan will work," Singh said. "We can't afford not to do this at this point, given how difficult it is for so many people to get the medication they need," he said. "Those measures would free up billions that would be available for this as well. The rest of financing would be a matter of discussion between the federal government and provinces and territories," Davies said. 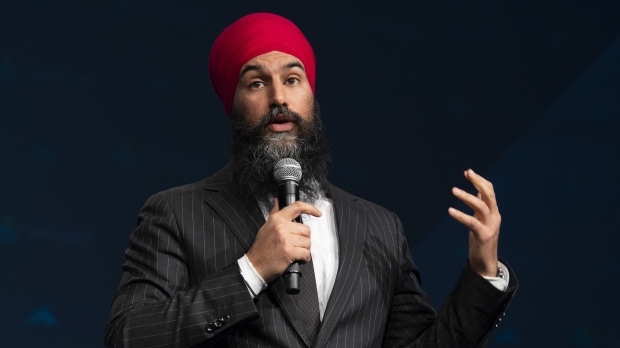 The federal government taxes 50 per cent of profits made on investments, or capital gains, but the NDP wants to increase that threshold -- known as the inclusion rate -- to 75 per cent. It said that would raise about $3 billion in revenue. Singh took aim at the Liberal government's pharmacare plan, saying it puts pharmaceutical and insurance companies "in the driver's seat." "The Liberal government is proposing to bring in a U.S.-style patchwork system that's only going to increase the premiums families pay," he said. In the budget, the Liberals promised a new agency to negotiate prescription drug prices for Canadians to try and drive down costs, a move it billed as an "important step" on the path to an eventual national pharmacare plan. It also promised to build a national formulary and promised to spend $500 million a year, starting in 2022, to subsidize drugs that treat rare diseases.